If you are planning to launch a brewery of your own, then the first step towards achieving success is building your brand. One of the major ways of doing so is coming up with a fantastic, unique, and original logo of your own. Provided below is a range of some of the best beer logos and designs on the internet. All logo designs have been designed by professionals, and are sure to come in handy. In this set, you will find about 16 beer logos and labels. These logos would be perfect if you were to design a label or a brand image for your company. The best part about this beer logo design is that it is resizable. As the name suggests, the resizable beer logo would allow you to resize or change its size as per your requirements. This template here is one of the standard examples of beer logos. The template comes with a beautiful yet meaningful image or design which is just apt for the theme. The Logo Template here is meant for design on the beer logo designs. If you want to design beer glasses, then this template can offer you both the design and format for it. Watercolor is often used in logos because it adds a special touch. That is precisely why watercolor logos are so popular. If that’s the look you want, use this template. 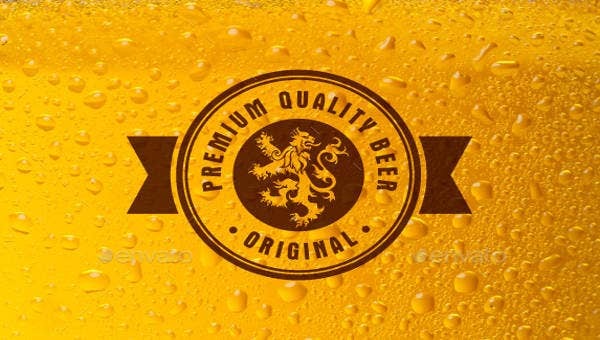 This beer design logo element here comes with a stunning and stylish design, an easy to use format, a fairly high resolution of 300 dpi, and color mode of CMYK. Badges also require logos and designs. They would need a simplistic or a minimalistic design with a logo. That is exactly what this template here provides. This beer logo template tells you exactly what such logos and designs should look like. If you are trying to come up with a design of your own, then you could use this as a sample. Here are numerous beer logo templates here to choose from. It is entirely up to you what you go for. A glass of beer must have a design or logo on it which hints at a specific brand. Now if you want to create a mockup or a sample of the same, then you can use this template for that. If you are planning to start a brewery or a company that deals in beer, you need a logo for sure. For that, you can use this beer logos product design. This template beer logo comes with a design that is in a fairly high resolution of 300 dpi. Plus, the first thing that catches your eye is the powerful logo on it. Logos should always be simple and to the point. That is exactly what you get with this beer logo template here. It is straightforward, to the point and doesn’t beat around the bush. Have you been looking for a logo that just screams beer? Then you need to take a look at this template now. One look at it would tell you what the beer logo hints at. This black hole beer logo would be perfect for a company that runs a brewery or deals in beer. If you belong to the mentioned category, you can use the logo template provided here. In this section here, we have brought to you a plethora of beer logos. Based on your needs and requirements, you are free to choose whichever logo design or template you want. You may also check Animal Logos. You just have to click on the download option to get started.